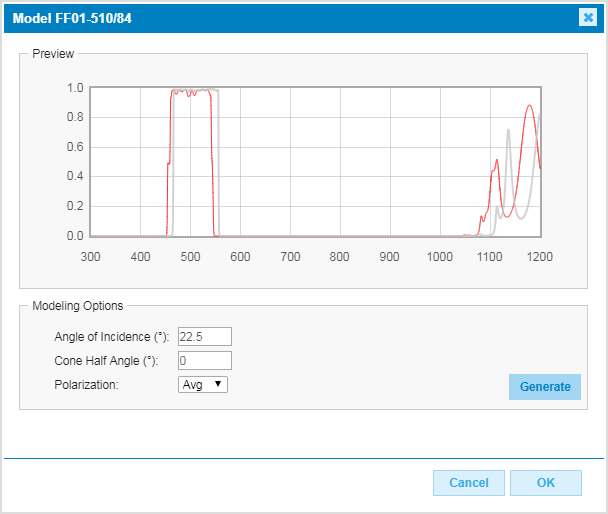 We are proud to release this online plotting tool designed for the research scientist working in fluorescence microscopy or the optical instrument designer working on next generation fluorescence-based systems. SearchLight allows you to easily select elements for your system, visualize the spectral properties, and quickly calculate critical parameters such as signal brightness, autofluorescence levels, and signal-to-noise ratio. With an intuitive interface one can easily test filter set compatibility with various fluorophores, see the effects of changing system components (light sources, detectors, objectives), or create custom arrangements for a unique application. 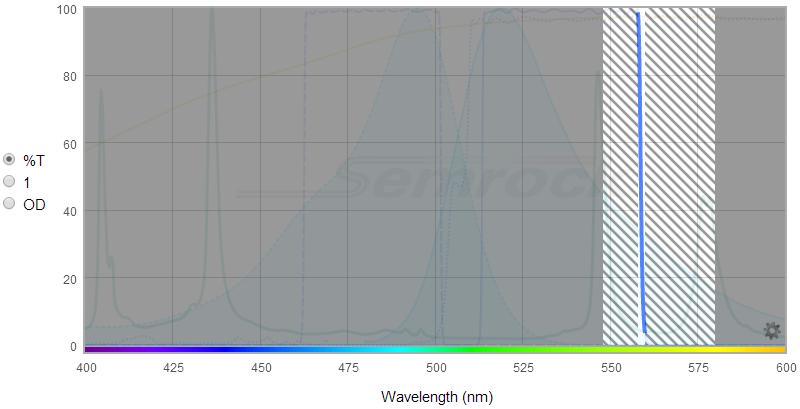 SearchLight contains an extensive library of 809 fluorophores, 182 light sources, 21 detectors, and Semrock’s entire library of 865 filters and 159 optimized sets. You may also upload your own custom dataset for any components not currently included as a selection choice. SearchLight can also save all of your results, custom data uploads and configurations to save you time when you return. You can also download each project to your computer and easily share important data with co-workers. To get you started, we have produced a short video to help guide you through the component selection and results viewing process. We now offer a SearchLight App available for iPhone and iPad. For additional details visit the Welcome page. We hope you find this online tool valuable and encourage you to send us an email and share your comments to SearchLight@idexcorp.com. Data Input (top left): Select from the extensive database of spectra for Filters, Filter Sets, Fluorophores, Light Sources, and Detectors. Enter your own spectra in My Data. Plotting Window (top center): View an unlimited number of spectra loaded into the Plotting Legend section, overlaid on a single, convenient graph. The Plotting Window enables rapid visual estimation of the compatibility among filters, fluorophores, light sources, and detectors. Plotting Legend (top right): Keep track of and modify spectra that are loaded into the active SearchLight environment. Select which spectra to view, modify plot characteristics, download spectra as ASCII data to your local computer environment, and remove spectra from the active SearchLight environment. Calculators (bottom): Evaluate absolute and relative signals (i.e., brightness or system throughput) and signal-to-noise ratios (contrast) for an unlimited number of combinations of filters, fluorophores, light sources, and detectors. Filters: Select from all available Semrock catalog filters. 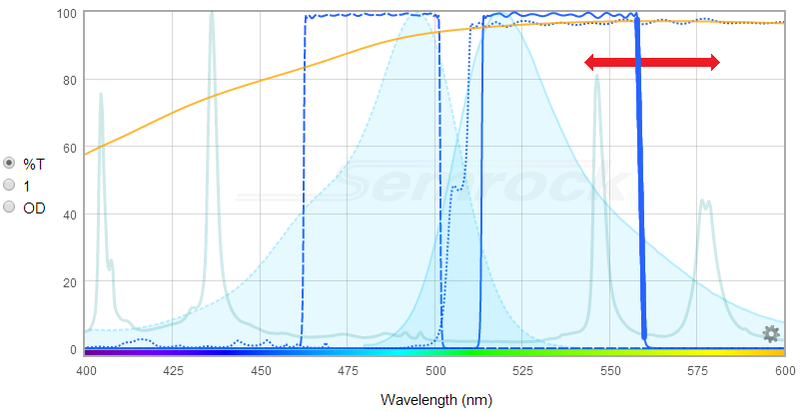 Filter spectra are based on theoretical designs of Semrock filters. Design (rather than measured) spectra are used to obtain the most accurate calculated results, since real measurement limitations and artifacts result in measured filter spectra that do not accurately represent the true edge steepness and optical density of a fluorescence filter. Filter Sets: Select from all available Semrock catalog filter sets, including single-band bandpass and long-wave-pass sets and multiband sets. Fluorophores: Select from an extensive list of fluorophores. Spectra are sourced primarily from the University of Arizona (www.spectra.arizona.edu) and Invitrogen (www.invitrogen.com). Fluorophore text file headers contain more source details. Light Sources: Select from a list of lamp, laser, LED, and other solid-state light source spectra. Spectra are based on manufacturer published data as well as measured data. Detectors: Select from a list of commonly used detectors. Detector spectra are based on manufacturer published data. My Data: Upload your own spectra (filters, fluorophores, light sources, and detectors) or model a bandpass filter or long-wave-pass dichroic beamsplitter spectrum. Uploading user data requires an Account. Files to upload should be ASCII text data with two tab-delimited columns The first column should contain wavelength values (in nm), and the second column should contain spectrum values (between 0 and 1). Text headers above the column data will be retained for your reference. Comments should be preceded by a "%"
Click the title bars containing the names of the different spectra types to expand a list of those spectra. Click once on the name of a spectrum in the list to preview (in light gray) a version of that spectrum in the Plotting Window. Double-Click the spectrum name or click the arrow to the right of the spectrum name to add the spectrum to the Plotting Window and Plotting Legend. Type in the box at the top to quickly narrow all the lists to items containing the search text. Sections with no matches are disabled. Clear the search results by selecting [ Clear search results] in the menu next to the search box [ ]. The Data Input section can be hidden to enlarge the Plotting Window. Click on the arrow on the right-hand edge of the Data Input section to minimize (hide) or expand (show) the section. SearchLight utilizes sophisticated algorithms to provide enhanced user experience. For example, you can Find compatible products for a selected fluorophore to narrow down a list of potentially compatible exciters, emitters, dichroics or filter sets. This function helps narrow down the list of filters however user judgement is required in optimal filter selection based on application needs. Current algorithms are optimized for broadband light sources and we are continuing to make improvements for other illumination sources such as LED based Light Engines and lasers. Expand an item-specific menu by clicking its [ ] icon in the legend. To close the dialog and add the modeled spectrum to your session, click OK. To close the dialog without adding the modeled spectrum to your session, click Cancel. If you have a Semrock.com account, saving the SearchLight session will save the modeled spectrum to your My Data section. Sharing the SearchLight session will provide modeled spectra to other users. Saving a shared SearchLight session will also save any modeled spectra to other users' My Data section. Click once on the name of a spectrum in the Data Input section to preview the spectrum in the Plotting Window (in light gray). Double-click the spectrum name or click the arrow to the right of the spectrum name to add the spectrum to the Plotting Window and the Plotting Legend. Click the gear icon [ ] in the lower right corner of the Plotting Window for general control and plotting tips. Hover the mouse pointer over any curve to view data point values associated with the x and y axes. Click the gear icon in the lower right corner of the Plotting Window. Click anywhere on the wavelength (x) or spectrum (y) axis label areas. Zoom by scrolling: scroll up to zoom in or down to zoom out. Zoom by click-and-drag: click and drag a box on the plot window to zoom in. Pan by click-and-drag: click and drag with the space bar pressed to pan. Restore default range: double-click anywhere in the plot window to return to the default axes ranges. The default wavelength range is 350 – 750 nm. The range can be expanded to as wide as 200 – 1600 nm. Click on the shortest or longest wavelength label to modify the wavelength range. The spectrum axis can be viewed on a linear scale (Transmission, 0 – 100%, or Normalized, 0 – 1) or on a logarithmic scale (Optical Density, where OD = – log10(Normalized value)). The default scale type is Transmission. Click the radio buttons to the left of the Plotting Window to switch among axis scale types. Click on the smallest or largest spectrum axis label to modify the spectrum range. The Plot Legend is a list of all the spectra that have been loaded into the SearchLight active environment from the Data Input lists. Once loaded, all of these spectra are now available to be visualized in the Plotting Window and added into Calculators. Spectra may in the legend may be organized into folders. Double-click a spectrum name or click the arrow to the right of the spectrum name in one of the lists in the Data Input section to add the spectrum to the Plotting Window and Plotting Legend. Change the order of legend items by dragging and dropping them. Expand or collapse any container item by clicking its toggle control. Show or hide a spectrum in the Plotting Window by checking or unchecking its checkbox in the Legend. Plot only the components from a given Calculator by selecting the Calculator name from the drop-down list in the Legend header, or by clicking the "Link to plot window" button within that Calculator. View all spectra in the Legend by selecting "All" from the drop-down list. Expand an item-specific menu by clicking its [ ] icon. [ Edit...] menu item. For each spectrum or group of spectra you can change the curve label, the curve color, the curve style (line style and thickness), the curve opacity, and whether the curve is filled or not. Download a spectrum to your local computer environment by clicking its [ Download] menu item. Add a new folder by clicking its [ New folder...] menu item. Remove a spectrum from the Legend by clicking its [ Remove] menu item. [ Add to cart] menu item. View a filter or set on semrock.com by clicking its [ View on Semrock.com] menu item. The product details will open in a new tab. For top-level control, click the [ ] icon in the Legend header. Download a zip file containing all spectra by clicking the [ Download all] menu item. Add a new root-level folder by clicking the [ New folder...] menu item. Remove all spectra by clicking the [ Remove all] menu item. Remove selected spectra by clicking the [ Remove selected] menu item. [ Add all Semrock products to cart] menu item. A SearchLight Calculator quantitatively computes the fluorescence signal, noise, and signal-to-noise ratio for unlimited combinations of filter sets, fluorophores, light sources, and detectors. Calculations are based on a straightforward mathematical framework, which is described in detail in the white paper Spectral Modeling in Fluorescence Microscopy. Besides the main spectra, additional system input parameters include other spectrally dependent losses in the system, the collection efficiency of the optics, and characterization of the fluorophores by quantum yields and decadic molar extinction coefficients. The power of the SearchLight Calculator is that it enables quantitative evaluation of the compatibility of filter sets with fluorophores and other spectrally dependent components of a system, analysis of crosstalk and bleedthrough, identification of optimal spectral edge locations for a set of filters under specific experimental conditions, and guidance regarding labeling protocols in multiplexing imaging assays. These analyses can be simultaneously conducted on multiple system configurations by creating multiple Calculators, thereby enabling multidimensional design-of-experiment analyses. The Calculator assumes the following typical epifluorescence microscope configuration with spectral features described in detail below. The calculations are also applicable to nonimaging systems, as well as to nonepifluoresence configurations. For example, it is not necessary to include the dichroic beamsplitter (when absent, its transmission and reflection spectra are assumed to be unity for all wavelengths). Schematic diagram of a typical epifluorescence microscope configuration based on optical filters (left), and examples of absorption and emission spectra for a target fluorophore, transmission spectra for a set of optical filters, and light source and detector spectra (right). The light source (black) is a xenon arc lamp with the detector response profile (brown) representing a typical (cooled) CCD camera. See Spectral Modeling in Fluorescence Microscopy for additional details. Name: The name of an instance of the Calculator. The name can be changed. Filter Set: The name of a 3-filter set. While an actual filter set can be comprised of multiple exciters and emitters, for the Calculator a set is assumed to consist of a single exciter, a single emitter, and a dichroic beamsplitter. Selecting a filter set that is loaded into the Plotting Legend automatically populates the exciter, emitter, and dichroic that are associated with that filter set into the drop-down lists below. For multiband sets, by default the first exciter and first emitter in the list are selected, but these can be changed. Exciter: The name of the excitation filter. This field is populated by default when a filter set selection is made. It is also possible to designate any individual filter as an exciter, even when it is not part of a filter set. The exciter spectrum is represented as TX(λ) in the diagram above. Emitter: The name of the emission filter. This field is populated by default when a filter set selection is made. It is also possible to designate any individual filter as an emitter, even when it is not part of a filter set. The emitter spectrum is represented as TM(λ) in the diagram above. Dichroic: The name of the dichroic beamsplitter. This field is populated by default when a filter set selection is made. It is also possible to designate any individual filter as a dichroic, even when it is not part of a filter set. The dichroic spectrum is represented as TD(λ) and RD(λ) in the diagram above, corresponding to the transmission and reflection spectra of the filter, respectively. Only transmission data is necessary to characterize the dichroic, since it is assumed that RD(λ) = 1 – TD(λ). Fluorophore: The name of the fluorophore. A fluorophore spectrum is comprised of two distinct spectra: the absorption spectrum and the emission spectrum. These spectra are loaded by default into the Fluorophore Absorption and Fluorophore Emission fields when a Fluorophore name is selected. To load a custom fluorophore into the My Data list in the Data Input section, it is required to load the (normalized) Fluorophore Absorption and Fluorophore Emission spectra as two separate data files. To provide a Fluorophore DMAC, add the following header to the absorption file: # DMAC: <number> . To provide a Fluorophore Quantum Yield, add the following header to the emission file: # Quantum Yield: <number between 0 and 1>. Fluorophore Absorption: The absorption spectrum of the fluorophore. This field is populated by default when a Fluorophore selection is made. The absorption spectrum is represented as φA(λ) in the diagram above. It is normalized such that the value at the peak absorption wavelength is equal to 1. Fluorophore Emission: The emission spectrum of the fluorophore. This field is populated by default when a Fluorophore selection is made. The emission spectrum is represented as φE(λ) in the diagram above. It is normalized such that the value at the peak emission wavelength is equal to 1. Light Source: The spectrum of the selected light source. For display purposes only, SearchLight automatically normalizes the displayed spectrum such that the peak value is equal to 1. However, for calculations SearchLight normalizes the area under the curve so that the total power integrated over all wavelengths is equal to the value entered in the Advanced inputs section of the Calculator. The Light Source spectrum is represented as L(λ) in the diagram above. Detector: The detector spectral response profile. The detector spectrum is represented as D(λ) in the diagram above. For CCD and CMOS cameras, the peak value of the detector response spectrum is assumed to be the peak quantum efficiency of the camera, whereas for all other types of detectors the spectrum is normalized such that the peak value is 1. This normalization convention should be kept in mind when loading a custom Detector spectrum into the My Data list in the Data Input section. Light Source Power (mW): The total power of the excitation light source integrated over all wavelengths. It is represented as PL in the diagram above. where n is the index of refraction (see below). Thus the fraction of total fluorescence emitted from the sample that is captured by the objective is Ω / 4π. Index of Refraction: The index of refraction of the medium between the objective lens and the sample. See Numerical Aperture above to understand the impact of the index. Reflected Excitation Light Factor: An empirical factor introduced to take into account the amount of excitation light that is redirected from the excitation path into the emission path (primarily by reflection off of the sample and its supporting glass). A default value of 0.07 assumes that 7% of the excitation light is redirected from the excitation path into the emission path. This value is assumed to be independent of wavelength. It is represented by the factor ƒER in the white paper. Transmitted Excitation Light Factor: An empirical factor introduced to account for the transmission spectrum of all other optics in the excitation light path. A default value of 0.95 assumes that the optics in the excitation light path (with the exception of the exciter and dichroic) have 95% transmission. This value is assumed to be independent of wavelength. It is represented by the factor Ti(λ) in the diagram above. Fluorophore Optical Depth (M cm): The product of the molar concentration of target fluorophore ("c" with dimensions of M = molar = moles/liter = 10-3 moles/cm3) and the thickness of a slab of fluorophore ("d" with dimensions of cm). That is, Optical Depth = c×d. This term can be used to optimize the ratio of fluorophore labeling concentrations in order to minimize bleedthrough, for example. Fluorophore DMAC (M-1cm-1): Maximum value of the decadic molar extinction coefficient (or decadic molar absorption coefficient, DMAC) for the target fluorophore. This quantity is a property of the fluorophore and its value is normally available from the fluorophore manufacturer. SearchLight Calculator automatically populates this value for the selected fluorophore when it is available in the associated data file. When this value is not available, it is assumed to be 80,000 and the DMAC field is highlighted in yellow. To correctly calculate crosstalk between fluorophores, the correct DMAC value must be used. The fluorophore DMAC is represented as ε10,peak in the diagram above. Note that Fluorophore DMAC × Fluorophore Quantum Yield is a measure of the brightness of a fluorophore. Fluorophore Quantum Yield: The Quantum Yield for the target fluorophore. This quantity is a property of the fluorophore and its value is normally available from the fluorophore manufacturer. SearchLight Calculator automatically populates this value for the selected fluorophore when it is available in the associated data file. When this value is not available, it is assumed to be 0.5 and the Quantum Yield field is highlighted in yellow. To correctly calculate crosstalk between fluorophores, the correct Quantum Yield value must be used. The Quantum Yield is represented as ηF in the diagram above. Note that Fluorophore DMAC x Fluorophore Quantum Yield is a measure of the brightness of a fluorophore. Autofluorescence Light Factor: An empirical factor introduced to take into account the relative strength of autofluorescence signal to the desired fluorescence signal. Its recommended value should be between 0 and 1. The default value of 0.1 assumes that the autofluorescence signal strength is 10% of the desired signal. This value is assumed to be independent of wavelength. Examples of sources of autofluorescence in imaging systems include the sample and its supporting glass, the primary objective and other lenses, optical filters, and any other optical elements. The Autofluorescence Light Factor is represented as ƒAF in the white paper. Transmitted Emission Factor: An empirical factor introduced to account for the transmission spectrum of all other optics in the emission light path. A default value of 0.95 assumes that the optics in the emission light path (with the exception of the dichroic and the emitter) have 95% transmission. This value is assumed to be independent of wavelength. It is represented by the factor To(λ) in the diagram above. Fluorescence Signal (mW): The total desired fluorescence signal that reaches the detector (just before the photons get converted to electrons). Note that the light input to the Calculator is expressed in mW and therefore the signal output is also expressed in mW. The Signal is represented by S in the white paper. Excitation Light Noise (mW): The undesired noise power that reaches the detector and which results from transmission and reflection of the excitation source light through the system, including reflection off of the sample as quantified by the Reflected Excitation Light Factor. This quantity is very sensitive to the overlap and edge steepnesses of the excitation and emission filters as well as the level and extent of out-of-band blocking in these filters. It is represented as NE in the white paper. Autofluorescence Noise (mW): Total noise power that reaches the detector and which results from undesired autofluorescence. It is represented as NAF in the white paper. Signal-to-Noise Ratio: The optical signal-to-noise ratio (SNR), equivalent to the Fluorescence Signal divided by the sum of the Excitation Light and Autofluorescence Noise values. Note that the calculated SNR takes into account only the optical signal and sources of optical noise. The calculation does not account for electrical noise which results when photons are converted into electrons in an actual detector (shot noise, dark counts, etc.). To compute the signal-to-autofluorescence-noise ratio only, simply set the Reflected Excitation Light Factor to 0. To compute the signal-to-excitation-light-noise ratio only, set the Autofluorescence Light Factor to 0. Link to plot window (next to the Calculator Name): When this button is checked in a given Calculator, only the inputs from this Calculator are checked in the Plotting Legend and displayed in the Plotting Window. The button may be checked in only one Calculator at a time. Checking this button is equivalent to selecting a Calculator name from the drop-down list in the Plotting Legend header. Normalize other Calculators relative to these values (below the Outputs): This feature is extremely useful. For most practical cases there is insufficient system knowledge to obtain accurate absolute values for Signal and Noise, yet relative comparisons among different filter-fluorophore-component spectra combinations can be highly accurate. By checking this button in a particular Calculator, the values for Signal, Excitation Light Noise, etc. in all other Calculators will be normalized to their respective values in the Calculator with the button checked. "Optimization Calculator" enables Calculator outputs as a function of variation in the spectral edge locations of filters. For example, spectral edge of a filter can be varied over a range, specified by Input Array, to calculate an array of Fluorescence Signal, Noise, and Signal-to-Noise Ratio. Any combination of Exciter, Emitter and Dichroic spectra can be simultaneously selected for such simulations. Here is an example of how to use this feature. Let us say, one needs to calculate change in Fluorescence Signal, when the Short Wave Pass (SWP) edge of the FITC-3540C emitter is varied over a range of -10 to +20 nm with respect to the nominal design. That is, calculate an array of Fluorescence Signal values when the highlighted edge (thick blue line) in the following plot is shifted over a range of -10 to +20 nm (denoted by red arrows) from the nominal design. Note that the nominal design of a filter refers to the filter selection in the corresponding Calculator. Select Emitter as the filter for simulation. Specify filter spectra range (in nanometers) over which existing spectral edge of the filter needs to be adjusted. Specify the range of variation (-Shift in nm and +Shift in nm with respect to the nominal design). Here, -Shift denotes a shorter wavelength and +Shift implies longer wavelength. Specify step size for calculation. Click the Calculate button to obtain the results of the simulation. To help with visual guidance, once the above information has been populated in the Optimization Calculator, display of the spectral plot changes as below. In this figure, the selected spectral feature is highlighted in blue (a thicker line), and the range of simulation is denoted by the patterned diagonal lines. A unique and powerful feature of SearchLight is the ability to save each of your SearchLight sessions so you can revisit your work at a future time or share it with your colleagues. A session includes the unique combination of spectra loaded into the Plotting Window and Plotting Legend sections, including all the controls applied to the Window and Legend, as well as the Calculators which were set up. Calculation results can also be saved and shared by printing a PDF or hardcopy of the plots and quantitative results, or by exporting the quantitative data to ASCII data files for further analysis in a different environment such as Microsoft Excel. In order to use the session management features (Open, Save, Save As, and Share), you must have a Semrock Account. You do not need an Account to use the Export and Print features. Login to your Semrock Account (or establish a new one) to enable SearchLight session management tools. Open: Open a saved SearchLight session to pick up right where you left off. Save: Save a SearchLight session to allow for later retrieval of the unique combination of spectra you loaded into the Plotting Window and Plotting Legend sections, including all the controls applied to the Window and Legend, as well as the Calculators which were set up in that session. Save As: Already have a session saved but want to make changes without overwriting the session? Save As a new session name to keep the original data as well as a new version. Share: Obtain a link to your current session to send to a colleague via email. Export (does not require an Account): Export all of the input and output data from the Calculators into an Excel file. The data from each Calculator is arranged in a separate column, so it is easy to manage the data from a large number of Calculators. Print (does not require an Account): Print to a PDF file the details of a SearchLight session and all of its Calculators. The first page of the file displays the Plotting Window and Plotting Legend with "All" Legend spectra, and each Calculator generates a subsequent page with an associated Plotting Window, Plotting Legend, and all of the Inputs and Outputs of the Calculator displayed. In order to load custom spectra into the My Data list in the Data Input section or to use the session management features (Open, Save, Save As, and Share), you must have a Semrock Account. Setting up an Account takes only moments and requires minimal personal data. The Account is identical to the account used for online quoting and ordering (using the shopping cart) of optical filters at www.semrock.com. An Account is necessary in order to reserve unique space for your data on the SearchLight servers. Don't have an Account yet? Register for the SearchLight spectra viewer. Expand an item-specific menu by clicking its [ ] icon in the legend. Add the standard size of a filter or unmounted filter set to your semrock.com shopping cart by clicking its [ Add to cart] menu item. The standard size of a filter or unmounted filter set are listed on the corresponding Product page. [ View on Semrock.com] menu item. [ Add all Semrock products to cart] menu item. The standard size of a filter or unmounted filter set are listed on the corresponding Product page. All items in a Compare System Calculator can also be added to shopping cart with a single click. Click the [ ] icon in the Calculator header. Add the standard size of all filters or unmounted filter sets to your semrock.com shopping cart by clicking the [ Add all Semrock products to cart] menu item. The standard size of a filter or unmounted filter set are listed on the corresponding Product page. Note: Semrock can only sell directly to US and Canada. For other countries, you may send the content of your shopping cart and Semrock.com Login contact information to your nearest distributor. A representative from the distribution team will be in contact with you shortly about your purchase. Fluorophore spectra are sourced primarily from www.spectra.arizona.edu and from Invitrogen Molecular Probes division (www.invitrogen.com). The SearchLight team acknowledges the efforts by George McNamara to compile an extensive database of fluorophore and light source spectra and make them freely available to the community. We also gratefully acknowledge the valuable feedback from our beta testers of SearchLight. Semrock does not share or sell personal information or data. User-uploaded data (in the My Data list in the Data Input section) may be reviewed by the SearchLight team to improve the SearchLight plotting tool functionality or to enhance future product offerings. SearchLight is for research use only and is not intended to be used for diagnostic or therapeutic purposes. Copyright © 2001 – 2017 Semrock, Inc, a Unit of IDEX Corporation. All other non-Semrock brands and product names used within this plotting tool and its supporting resources are trademarks of their respective companies. Contact the Semrock team responsible for SearchLight at SearchLight@idexcorp.com with your questions and comments. Semrock is a part of IDEX Health & Science, LLC.